Do I have to trim every month? No you do not. Most people receive results from one new moon phase trim. I believe you can continue to get results for up to 5 months after one new moon phase trim. Simply follow you regular trim schedule. you can do it one time if you like. I believe you can get results up to 6 months after your trim. The only way to know for sure is to try it and keep an accurate record of your growth increase. For accuracy it helps to measure in the same area each time and also keep the hair in the same condition each time you measure. 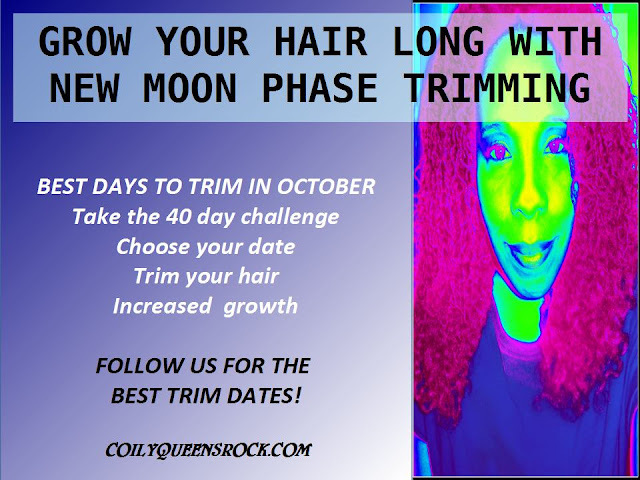 If you did your first trim on stretched hair then remember to stretch your hair when you do your follow up measurements in 40 days. Hopefully you have a better understanding of what the New Moon hair growth method is and how to practice it. If you are one of those women who are afraid to cut your hair, fear not, your hair will grow back and you will gain even more. Trimming your hair is a part of a good hair care regimen, you should trim every 4 months that is 3 times a year. Now that is not bad is it? Your hair will love you for it and it will look so much healthier. I cut two inches from my bangs on August 17th, as of January 29th, my bangs have grown back 4.25 inches. I gained 4.25 inches of new growth in 5 months. My regular rate of hair growth is 1/4 inch per month. The new moon method has almost given me a consistent 1 inch growth increase over the past 5 months. Four and 1/4 inches in 5 months. The average rate of hair growth per month is 1/2 inch. I exceeded the the average! Praise God! On January 14th I did another New Moon trim, I cut 1/4 of an inch and that has grown back already. So what are you waiting on? Get your supplies ready and mark your date.